Summary: Mina Grime is unlucky, unpopular and uncoordinated; that is until she saves her crush’s life on a field trip, changing her High School status from loser to hero overnight. But with her new found fame brings misfortune in the form of an old family curse come to light. For Mina is a descendant from the Brothers Grimm and has inherited all of their unfinished fairy tale business which includes trying to outwit a powerful Story from making her its’ next fairy-tale victim. Well where to begin… I was drawn to this book because of the title which quickly stands out as a twist on the well known fairy tales and I was not disappointed. 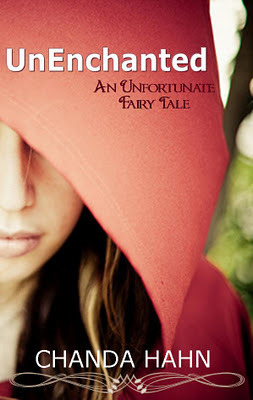 This book has action, romance and fairy tales what else could you possibly want! Chanda Hahn’s introduction to the different characters is done quickly but effectively so that we understand the character dynamics but are not bored by the little details. She gives little hints into the different roles they might play in each fairy tale ‘Story’ throws at Mina. As the book progresses the reader is left guessing which fairy tale is playing out as it includes the smaller less well known stories but it adds to the intrigue of the book. It’s fun guessing which one Mina is facing next and you feel yourself being part of the action despite the fact the story is in third person but that allows the reader to get more than one perspective on the scene playing out. The romance between Mina and Brody is established very quickly and not very realistic but then not many fairy stories are, obviously. However, Chanda Hahn manages to effectively create a love triangle between Mina, Brody and Jared, a helpful yet infuriating Fae. This book is well written and a great read, I would recommend anyone to read it even if you don’t like the classic fairy tales it gives them a modern unique twist.